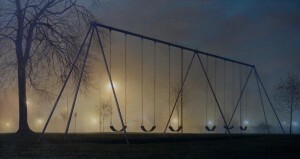 Stephen Fox was born in Richmond, Virginia, in 1957. By the fourth grade, he knew he would be an artist of some kind—his earliest serious work was drawing and inking his own comic books. 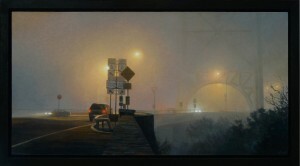 His interest in art and oil painting blossomed in college (V.C.U., Richmond, VA), where he studied painting and printmaking, receiving his BFA in 1980. 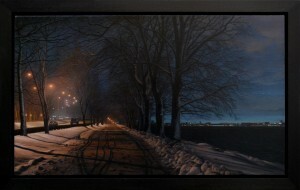 His very first night paintings, a subject that has remained the focus of his work to this day, were made in the final two semesters of college. Almost immediately upon graduation, his paintings were featured in Virginia Museum of Fine Arts juried exhibitions, winning critical acclaim and interest from galleries. He received a Virginia Commission for the Arts Professional Artist Fellowship in 1982, the following year he had his first solo exhibition at Cudahy’s Gallery in Richmond, Virginia. The show was a sell-out in just two days. 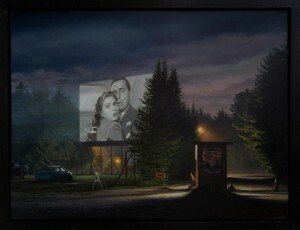 The following year, Fox became a recipient of a Southeastern Center for Contemporary Arts Professional Artist’s Fellowship, and his paintings were featured in an exhibition to commemorate the award. 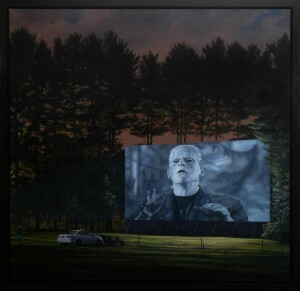 Over a span of a decade, he also became a three-time recipient of the Virginia Museum Professional Artist’s Fellowship. His work quickly attracted national interest, and in 1986, he had his first one-person exhibition at O.K. Harris Works of Art in New York City. 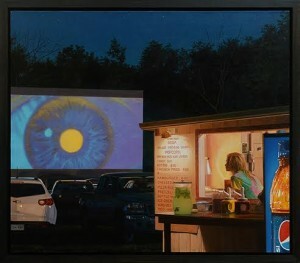 Ivan Karp, the owner/director of the gallery, described his work as “borderline Photorealism”, acknowledging that the artist’s nighttime landscapes, while partially photo-based, often had a quality of mystery or gentle symbolism at their core that separated them from paintings solely focused on the world of forms and photographic detail. The artist had many successful one-person exhibitions at O.K. Harris over the next two-and-a-half decades. In 1995, after painting and showing consistently ever since graduating from college, Fox entered the graduate painting program at the Maryland Institute College of Art, in Baltimore, MD. 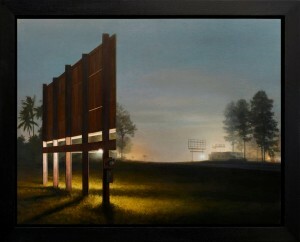 There he further refined the subjects that recurred in his paintings—glowing phone booths, illuminated billboards, interstate highways and after-hours parks and playgrounds. He also developed the new element that had been entering his work—the human figure. While his landscapes were never devoid of the objects and concerns of humanity, they were mostly places of quiet and stillness, locations emptied out of the people who might have busied about the space during daylight hours. 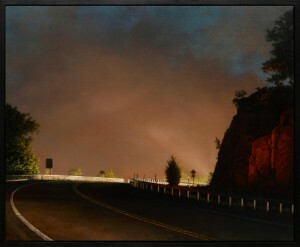 Paintings that focused on highways conveying people through the night landscape in cars and large trucks evolved into a study of the people navigating the nighttime world themselves, and how the quality of stillness that so defined his early landscapes might be found in figurative works sometimes bordering on portraiture. In 1997, Fox moved to Brooklyn, NY, where he resides today. 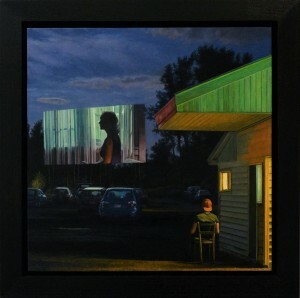 His work has evolved on both tracks of subject, the moody night landscapes and paintings of the people inhabiting them. 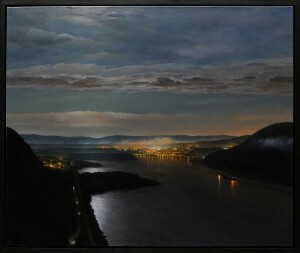 Many of his landscapes in recent years are drawn from the mountains above New York City, the highlands area of the Hudson River and the Adirondacks. Often the two subjects merge together, figures quietly going about their lives in a world where the multi-colored lights of man supplant the bright white of day. Stephen Fox continues an active exhibition schedule and his work is in numerous private and corporate collections all across the world.